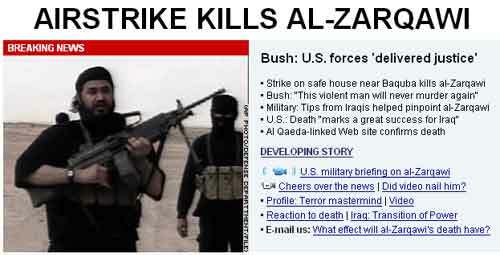 FOX News was quick and concise: DEAD, in capital letters over a red spatter of fresh blood. There’s a slightly grim sense of victory here, a tight-lipped, clenched-fisted war room kind of ambience, not quite the cathartic explosion of audacious jubilation I would have expected from FOX News. CNN showed a marked sense of excitement, liberally sprinkled with Bush quotes, including a “justice is served” subhead to drive home the victory of the moment. Plus, there’s the screengrab from that classic Zarqawi With Jammed M249 video. 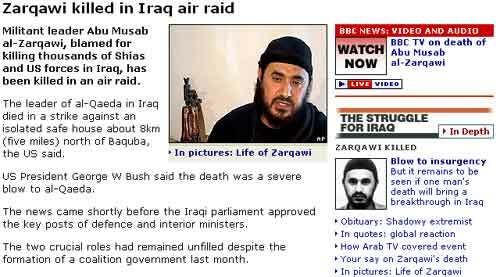 The hatred for Zarqawi projected by CNN’s Zarqawi box is palpable, giving us even more of a “RAH RAH USA KILLED THE BAD GUY” vibe than FOX News, interestingly enough. I’m also surprised that they didn’t use a bigger font for the main banner; they’ve gone much bigger before. 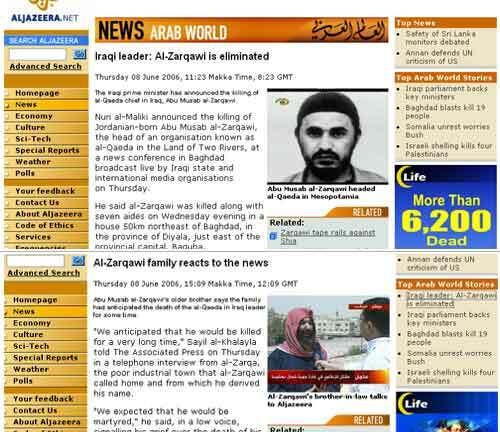 Al Jazeera, of course, is quick to get feedback from the Zarqawi family in Jordan, who fully expected this and give praise for his martyrdom, etc, etc; but note how the headline article studiously refers to Iraq as “the Land of Two Rivers” or “Mesopotamia” when referring to Zarqawi’s al-Qaeda affiliation. It’s like the scholarly types at Al-J really want us kafir to see the illustrious cultural richness of the Persian heritage vis-a-vis the terrorist insurgency, or perhaps they’re stressing that Zarqawi’s al-Qaeda operational reach went beyond Iraq’s boundaries, to the rest of the region. Oh, and that “Life” box in the sidebar provides endless irony. 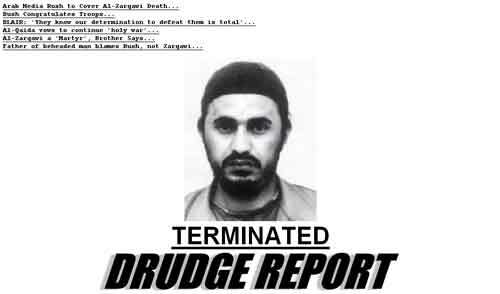 Oh come on, Drudge, you can do better. 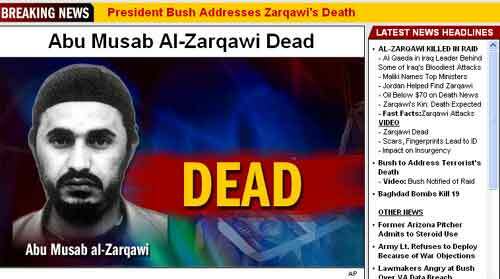 How about “Iraq Jumps the Zarq”? Or at least use some red, like FOX did? Or an exclamation point or three!!! Sploid‘s story looks fairly conventional, but the real juicy is in the juxtaposition with other tabloidesque article headlines. Note the “God Strikes Again and Again,” which, though being about lightning, could at first glance be thought to refer to God smiting America’s enemies. And you can’t miss that “Bin Laden Hunter’s Parrot Pardoned” box. On the other hand, these tabloid story boxes shift around a lot as the news changes, so what’s in this screenshot might not necessarily be what you see when you go there. More from Metafilter, Michelle Malkin, Tom Tomorrow, Little Green Footballs, Scott Adams, Cox and Forkum, Daily Kos, Barack Obama, and George W. Bush. Hey, don’t say I link you to only one end of the spectrum. I believe you meant “ordnance,” unless we somehow killed him by throwing law books at him. Oh man, I can’t believe I made that mistake. Thanks, and it’s corrected. Let us be patient with the BBC. Yesterday was a sad day for them. One of their heroes died.